Before I get to stocks, I must admit that I am a bit angry. Since Mr. Obama told us business owners that we weren’t really responsible for building our own businesses and the government was really responsible for our existence, I have been doing some thinking. A toilet handle broke in one of my businesses and I did what any business owner totally indebted to the government for my existence would do. I looked up the White House on the Internet so I could report the breakage of my toilet handle. Surely since government is responsible for my business, it seems they would have a link on their web page so we business owners could get government personnel out to fix things like toilets. But no, there weren’t any links for toilet repair. There weren’t any links for repairs of any kind. There weren’t any marketing tools to help with advertising. There weren’t any links for help with signage. Mr. Obama, if you are going to take credit for my business existence, shouldn’t you also provide services for things like toilet repair? You did say you were responsible, right? Then where are you when I need you? I am now getting more angry that government started my business for me but now I can’t get a little help with toilet repair? This is part of running businesses Mr. O. Nevermind. I’ll stick my hand in the toilet and fix the arm myself. Just like I do, and have done, everyday since the inception of my business. I do it all myself!!!!! Well if I start my business and maintain my business all by myself, is it too much to ask of government types like Obama to say the hell out of my life and my business??? Jerks! Wednesday, US gasoline prices hit an all-time high for August 22. The reason reported was a shortage of product. In truth, the central bankers have injected inflation into the markets my serially proposing further ‘stimulus’ efforts. They have inflated stocks. They have inflated bonds. They have inflated corn prices. 40% of US corn supplies go to make ethanol for gasoline. As corn prices rise, so too do gas prices. In addition, an accepted figure is that some 75% of everything we buy in the grocery store is affected by the price of corn. 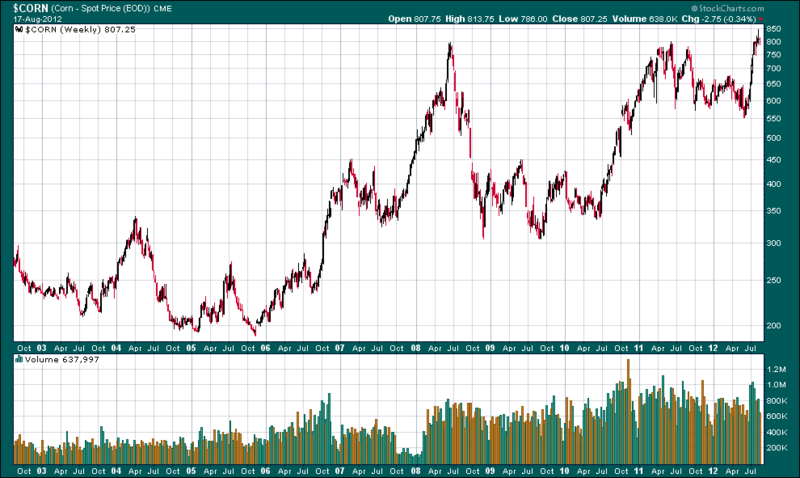 Prices rise when currencies weaken and fed ‘stimulus’ weakens currencies. The idea of gas prices rising due to ‘shortages’ is just a ploy to divert attention away from the cause and effect of Fed ‘stimulus’. Readers come here for the truth so there it is. The Dow lost ground everyday this week except Friday because central bankers downplayed the injection of more bond buying. And as we all know, when the Dow drops, Bernanke comes to the rescue. As the Dow threatened to break below 13,000 on Friday morning, news that Bernanke was considering more stimulus hit the tape. Up went the Dow. Sure the pundits all postulated all kinds of reasons for the movement in stocks. With almost all of the economic news continuing to show weakness, and almost all of the corporate news continuing to show weakness, we should all expect stock weakness. But Bernanke cannot tolerate that. Everyone is guessing right now when the next magical injection might occur. Want the truth? The next Fed announcement of action won’t occur until the Dow drops into the mid-12k range. Who cares about trivia like corporate earnings or economic data? The Dow is now the Fed’s to drive. They own it. On Friday, economic data showed that capital goods orders fell 3.4% - the biggest drop since November. Durable goods rose 4% but that rise was due solely to transportation orders. Ex-transportation, durables fell. Seems bad, right? Well, on this same day, Bernanke released a letter to Congress saying that his stimulus gun was still loaded and he was ready to act if the economy didn’t show some more strength. Guess which story made the Dow rise? Yep, economics no longer matter and neither does a ‘market’. The Fed controls the stock indices and the indices react to every Fed flinch. So the question is very simple. When will the Fed announce their new stock manipulation program? Again kids, don’t try this at home. Conspiring to manipulate stock prices is a crime. But not for central bankers. It is their job! I have enlisted the chart below for some help on the timing of the next Fed intervention. The chart is a picture of the Dow over the passed 7 years on a weekly basis. The wavy blue line is the approximate 200-day moving average. 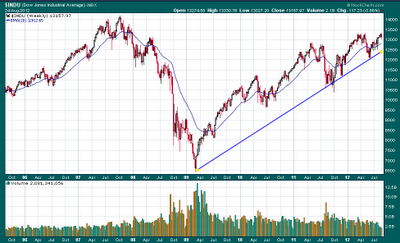 The straight blue line is my interpretation of what I call the ‘quantitative easing bull market’ support line. Of late, central bankers only bluster and threaten intervention. I suspect should the Dow be allowed to fall to the straight blue line, the Fed will spring to life and the next bull run will follow. 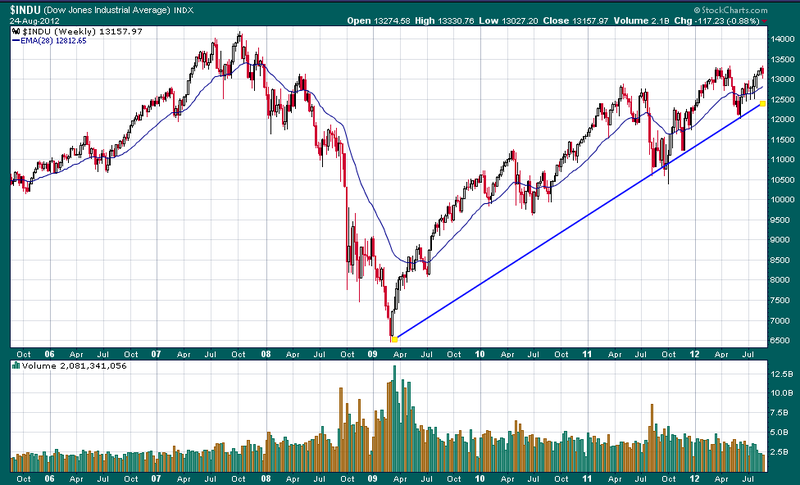 If the Dow should fall to 12800 (the support line), buyers should step in quickly to beat the Fed to the draw. If there is any risk in stocks, it is the waning power of the bull runs. If we were to draw a line connecting the tops, our line would start to look like an arc. 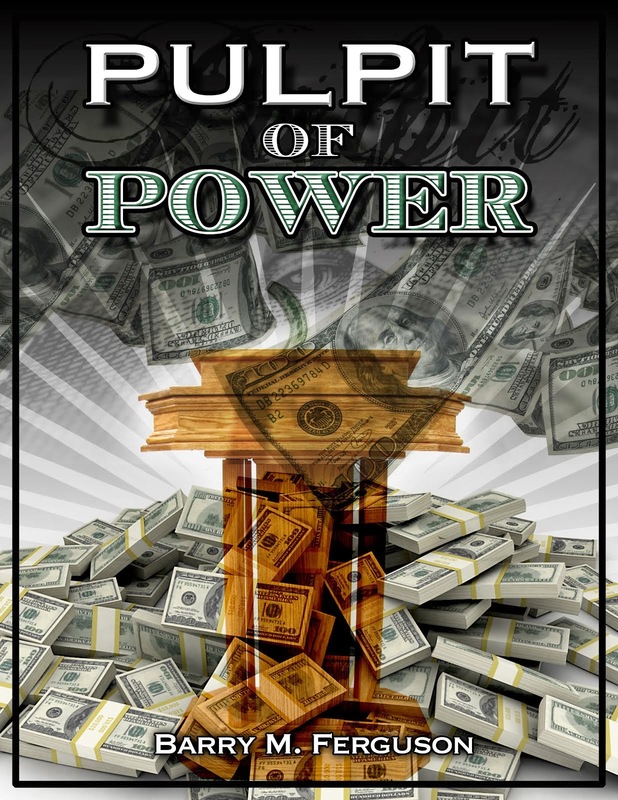 Each bull run seems to exert less power than the previous run. And, the volume continues to wane as well. But that stuff is only for worry-worts. We have the illustrious Mr. Bernanke to protect us from any nasty bear market tendencies that used to be a normal part of stock behavior. But no more. They are not allowed. So ideally, we would like to see the Dow pull back to 12800 at which point Mr. Bernanke would jump out to announce the next bond purchase program. Otherwise, stocks could fail and so too would the ‘recovery’. We all know Mr. Bernanke no longer has a choice. The only question is when. Maybe the chart below is telling us what we need to know. The current economic picture is rather gloomy. Europe is a mess. They are drowning in debt. Central banker Draghi is offering a lifeline that is inflated with more debt. Somehow believers want to believe more debt is the answer. China is slowing and almost no one believes Chinese data. Most pundits believe China is slowing precipitously. Their government is offering more debt a stimulus. Most believers want to believe more debt will perk up the economy. Of course, China exports heavily to the US and while the US regime claims all is well and recovery is taking hold, only worshippers of the regime share this belief. Just this passed week, we learned that mortgage delinquencies were rising again. It does not seem plausible that the Chinese economy could slow while the US economy strengthens. We should take note that only the current regime claims that things are getting better. Economic growth data from previous quarters is getting revised lower and expectations are getting reduced. Stocks? Well, stocks are riding the bubble of central banker inflation. Every time indices threaten to weaken, a central banker somewhere pops out to offer ‘stimulus’. What they mean of course is more debt. These central bankers are trying to prop up equity markets by manipulating interest rates to zero. Sure, they can get rates to zero. All they have to do is buy up all the sovereign debt in the world. Then who owns these supposedly sovereign nations? Right - the central banks. That is the goal. But the populous has no understanding of pure evil or economics or almost anything that doesn’t involve some ridiculous reality TV character. And, as long as the stock indices continue to churn higher, no one will complain of lost liberties or lost capitalism. But given the overall economic weakness of world economies, and given the enormous debt loads of governments and individuals alike, and given the risk of imminent financial collapse at the twinkling of a derivative deal gone bad, the case of the rising stock indices would surely indicate that we are in bubble land. I believe we have entered into the greatest bubble ever blown and when this one pops, everyone is going to lose everything. In a sense, investors have already lost everything. They have surrendered capitalism. They have surrendered the ability to control currency valuation. They have accepted debt that can never be repaid. They have surrendered intellect. And, they have surrendered their future. Central bankers have all that stuff and they alone control the currency. When they say the currency is no longer valid, it will all be gone regardless of what investors see on their monthly statements. That day is coming soon. The chart below is a look at this passed week. The Dow is in candlestick and we can clearly see that every time the Dow threatened to roll over, central banker manipulation propped it back up. I don’t know that there is any significance to the 13,000 level on the Dow, but the central bankers sure look head strong to defend it. Even Friday was a curious day. China announced very poor export numbers. That would seem to indicate that they were not exporting much to the US. Global economic expectations were again ratcheted down. Yet, it didn’t seem to matter. The Dow stumbled around until the last hour of the day when it lurched higher by over 40 points. A quarter of the days volume came in during the final thirty minutes of trading. To this, I say, ‘Good job Mr. Bernanke’. Of course, this little rally was instigated on this day by a Fed member saying more stimulus was needed. The bubble kept expanding. Oh, just one more thing. 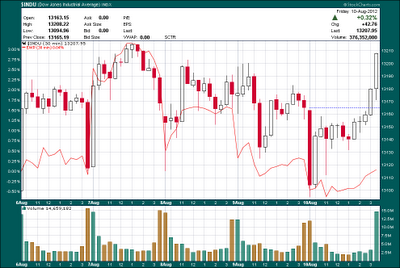 That red line is the EWP - the Spanish ETF. Readers may want to brush up on Spain but they are most likely entering into their own Greek-style debt depression. Didn’t matter. 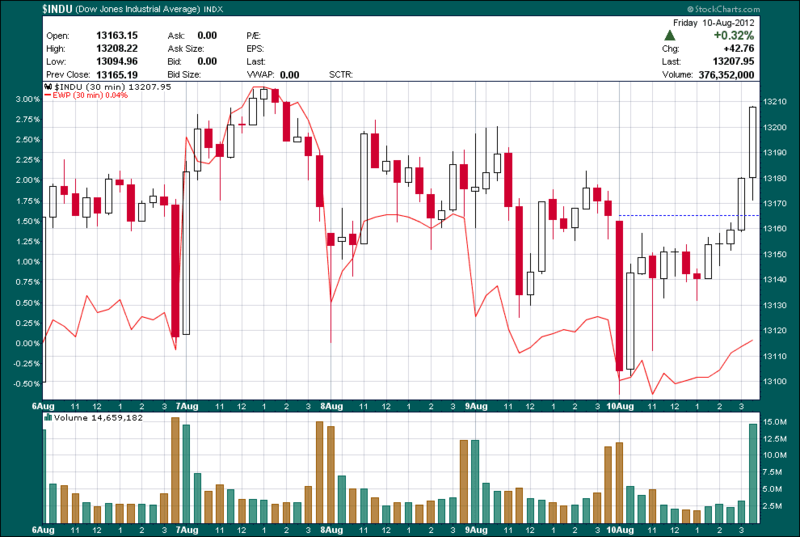 As we see from the red line in the chart, the EWP pretty much tracks the Dow. How’s that? Yep, regardless of solvency, almost all indices move together these days. Bubbles tend to play out like this. And of course, there is a lot of money to be made in bubbles. We just don’t want to be there when they pop. Bubbles Bernanke will surely declare ‘bank holidays’ when this happens to give his fellow robbers time to pilfer whatever is left of American savings. So, please don’t confuse whatever it is we are doing these days with investing. We are just riding the bubble while the central bankers inflate everything together.